DFA Fighting Systems is an eclectic blend of martial arts used for street defense, not tournament competition. It is a blend of Kali-Escrima, Pangamut (Filipino Empty Hand), SE Asian Kuntao, Silat & Muay Thai. Kuntao is a southern Chinese word (Hokkien) used to describe many of the Chinese empty hand methods of fighting, and properly translated it means Fist Way. It is said to have been created between the 14th and 16th century by the Muslims of Indonesia blending Chinese Kuntao with Silat but purely Chinese Kuntao styles can be found in China and Taiwan. 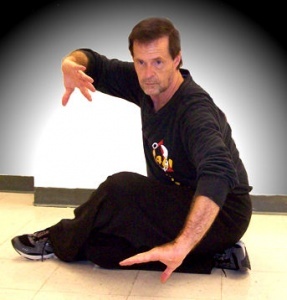 It is basically a blend of Southern kung fu (hands) and Indonesian Silat (footwork, sweeping) and modern versions have a large Filipino Kali influence. It can also be found in Indonesia, Malaysia and the Philippines (where it is called Kuntaw). It is sometimes referred to as Filipino kung fu. 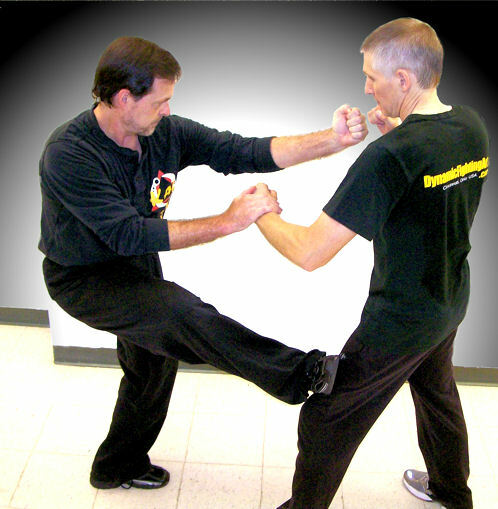 Kuntao is a fighting system that uses the natural weapons of the body for striking, kicking, throwing, and joint manipulations. Weapons training in Kuntao consists of the Long and Short Staff and the use of bladed weapons (swords & knives) of various types. Our students also train in the rare Fighting Sash & Sarong of Kuntao. Kali (sometimes called Filipino stick fighting) is actually a sword-based art, meaning that the original techniques are designed for use with a sword. Kali is also an incredibly complex art. Mastering the sticks alone can take years, you have the single stick, double stick, stick & dagger and long staff (bangkaw). Then you have the dagger, double dagger, whip and other weapons along with empty hand (Pangamut), elbows, knee strikes, kicking and joint locking techniques. Other Filipino arts include Panantukan (Filipino Boxing), Pananjakman (Filipino Kicking), and Dumog (ground fighting). We draw from the arts of Pekiti Tirsia, Doce Pares, Dekiti Tirsia Siradas, Lameco, Sayoc Philippines & Balintawak. Filipino Dumog is used for the bulk of our ground fighting. Dumog is the term used in the Filipino arts to refer to wrestling techniques. It is also goes by the names of Buno and “Combat Judo”. Buno is the term typically used in Luzon, specifically in the Southern Tagalog provinces as far south as Mindoro while Dumog is the term more widely used in the Visayas and Mindanao. 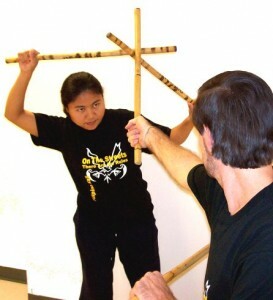 In general, dumog is a basic Filipino technique that is often taught along with KunTao, Kali and Silat, styles. A dumog technique encompasses a variety of pushes, pulls, weight shifts and joint locks designed to “move” the opponent. It is a term used to describe a technique that creates a quick change in weight or force which is very similar to the soft styles of martial arts such Aikido. Silat (“fighting by using techniques of self-defense”) is a Southeast Asian martial art with roots in the culture of the Malay World. This art is widely known in Indonesia, Malaysia, Brunei, and Singapore but can also be found in varying degrees among the Malay-affiliated countries of Thailand and the Philippines. It is estimated that there are hundreds of styles. Many of the styles pattern themselves after wild animals such as Tiger, Eagle and Monkey. Common techniques include kicking, hitting, tripping, sweeps, locks, takedowns, throws, strangles, and joint breaking. There are over 100 styles of KunTao & Kali systems in existence today! It would be impossible for anyone to even come close to learning every style. One might then ask: “well, which is the best style to study?” Unfortunately, however, this question has no simple answer. Each person has a style or styles that best suites them depending on their speed, size, build, and of course personal taste. So what may be the best style for you, may not be the best style for someone else. That is why at Dynamic Fighting Arts we try to tailor the art to the student. Sure, we have a set curriculum of techniques and basics. But, if you are not flexible we focus on low kicks or hands. Like to grapple? We work on that. Weapons your thing? No problem. We want to make sure that everyone gets something out of their training.